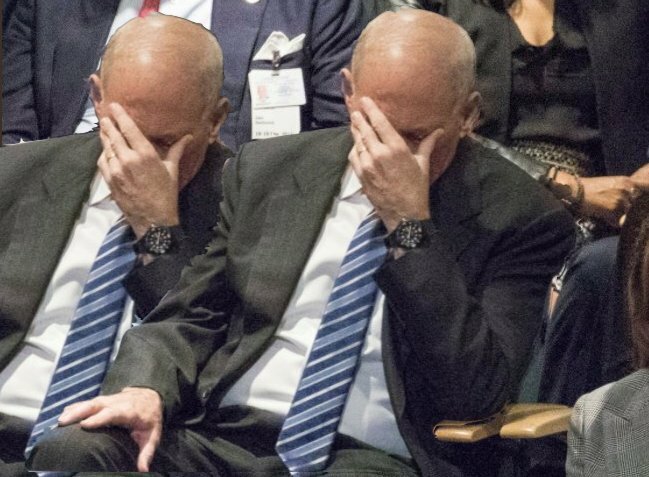 John Kelly has his head bowed in frustration and shame as Trump refuses to condemn neo-Nazis, white supremacists and Ku Klux Klan members who participated in the unite the right rally in Charlottesville on August 11th-12th 2017.
as one of the white nationalist rally participants plowed his speeding car into a crowd of peaceful protesters, according to the Charlottesville Police. 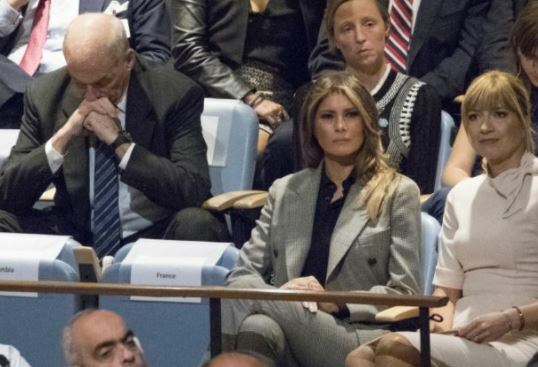 These two photos of a suffering Chief of Staff were taken today during trump's UN speech to the General Assembly where he vowed to destroy North Korea if they continue to build a nuclear weapon arsenal. You should. The general's body language certainly said a lot during the Political Apprentice's controversial "blame on both sides" remarks about the violence in Charlottesville last month.
" The scene is set for waves of tension between General Kelly and our impulsive, self-absorbed and misinformed chief executive. the cumulative effects of trump's compulsion to go AWOL. And it will be tough to persuade trump that this should not be a family-run business. " when does General Kelly become a white supremacist and a racist? 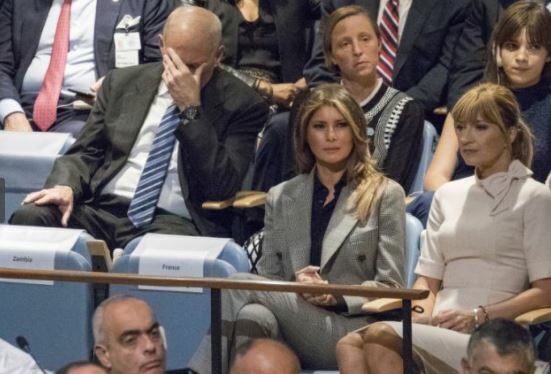 The very stressed John Kelly never knows what Trump is going to say until he actually says it. John Kelly is taking the mantle from Clyde Beatty and we'll see how long he will survive in the Lion's Den. 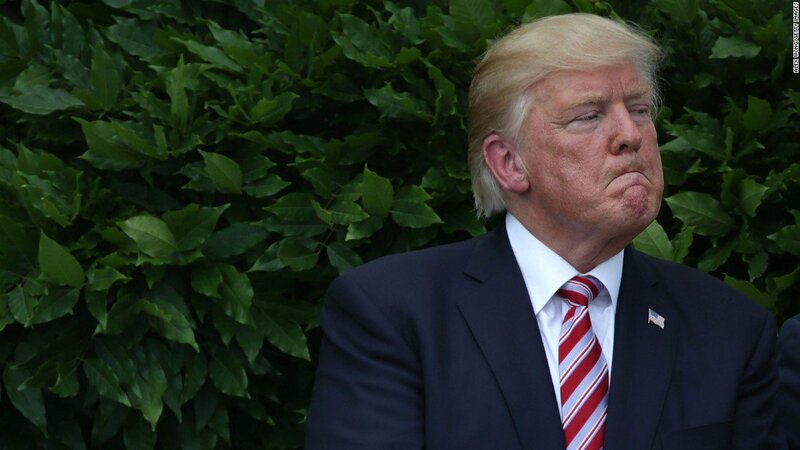 Here is the vengeful, vindictive trump publicly humiliating the retired General for his public reactions during trump's speeches. 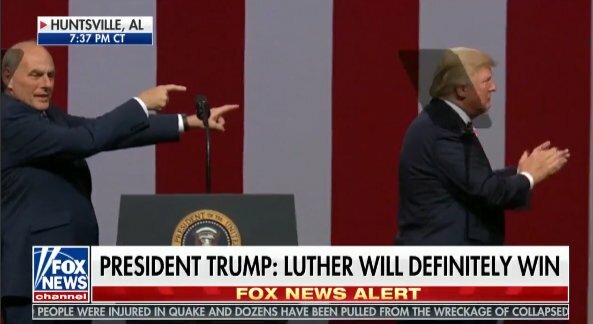 Nobody can get away with trying to put trump on a leash. trump reminds me of a Vicious and Nasty Chained Junkyard Dog. Even though he's chained, you know that dog is getting ready to break that chain and could be at your throat in minutes unless you make a quick retreat. <blockquote class='ipsBlockquote' data-author="mr6666" data-cid="1583914" data-time="1506195247">mr6666, on 23 Sept 2017 - 2:34 PM, said:mr6666, on 23 Sept 2017 - 2:34 PM, said:mr6666, on 23 Sept 2017 - 2:34 PM, said:mr6666, on 23 Sept 2017 - 2:34 PM, said:mr6666, on 23 Sept 2017 - 2:34 PM, said:<p>"Trump can be seen egging on an obviously unwilling Kelly to the stage before the Chief of Staff simply stops, acknowledges Trump with a tepid finger point, and then turns around and walks away....,... even Kelly’s presence at Trump’s Alabama rally could not curb the apparent unhinged, rambling stream of consciousness that Trump spewed from the stage as he jumped between his favorite topics: crowd size, the wall on the Mexican border, the electoral college, and Hillary Clinton.Kelly was certain, though, that he wanted no part of it.http://verifiedpolitics.com/trumps-chief-staff-just-abandoned-stage-alabama-rally-watch/Oh, look, there's Al Jolson up there on the stage with trump, in black face and all singing--" Alabamy Bound ". It must be 1939 again. How much more can this man take? Trump's chief of staff, a retired general whose son died in combat, attempts to quell the phone call controversy. But how many times will this work? The chief of staff delves into his own tragedy to defend Trump’s call to a military widow — and offers an apparent rebuke of his boss’s coarse ways. 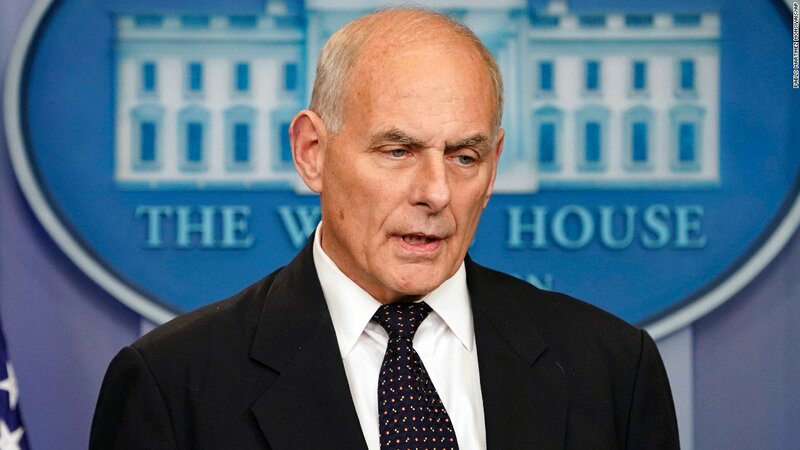 Kelly reiterated that Obama had not called him after his son's death, but that he had gotten a letter,..
At what point does Kelly really stop being patriotic and becomes an enabler to a man who is not only unqualified for the job, but who is dangerous to the existence of people in the entire world. Reportedly Kelly and Mattis have already rehearsed what they would do if trump wanted to launch a nuclear strike. 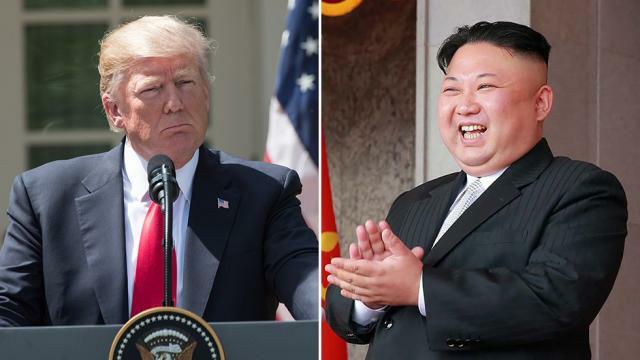 If Kelly and Mattis really cared about the future of the United States and the world, they would go down to the Congress with the 25th Amendment and do what needs to be done. goes after the Congresswoman who was telling the truth. You sleep with dogs, you wake up with fleas and maybe a little rabid thinking. lying buffoon like Donny MAGA must be hard to swallow. Well, General Kelly is certainly no General MacArthur. trump's fake hairdo couldn't stand the Heat in Harry Truman's kitchen. 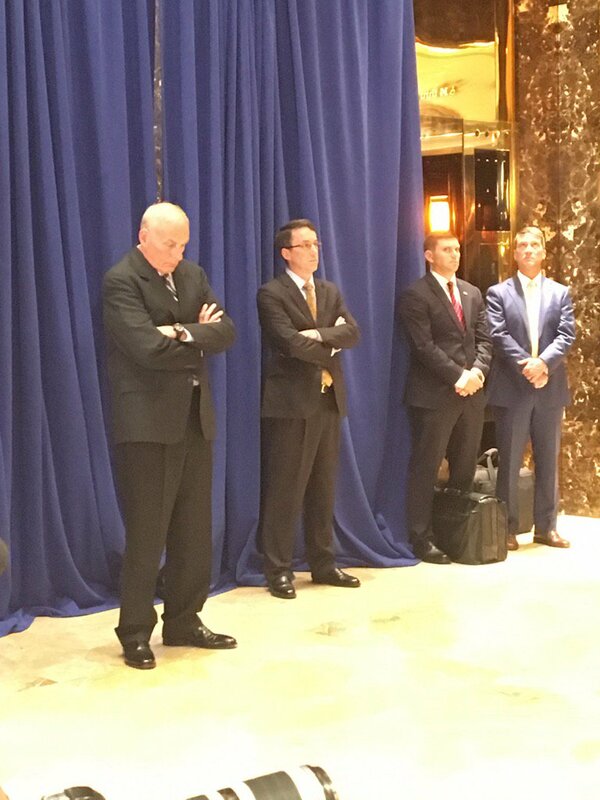 But at this moment, I bet General Kelly wishes that he could "just fade away". I'd call that a good thing. Truman took care of Dugout Doug. It was nasty, personal, and, as the Miami Herald reported, a lie. 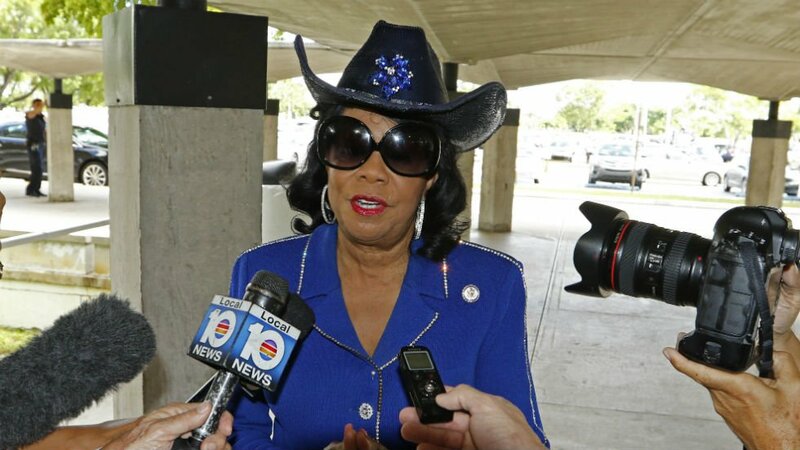 And Rep. Wilson didn’t say a bad word about Kelly. 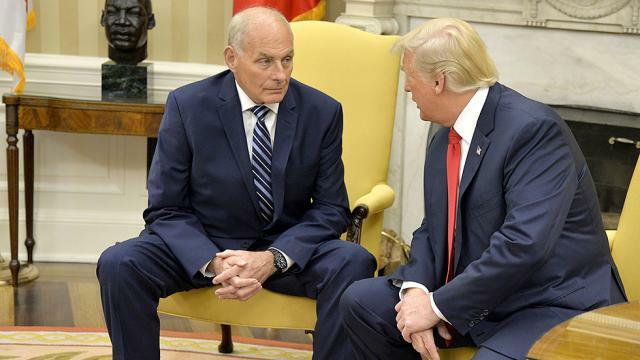 Feel like we saw several sides of Kelly today that people either didn’t know or didn’t acknowledge exists. 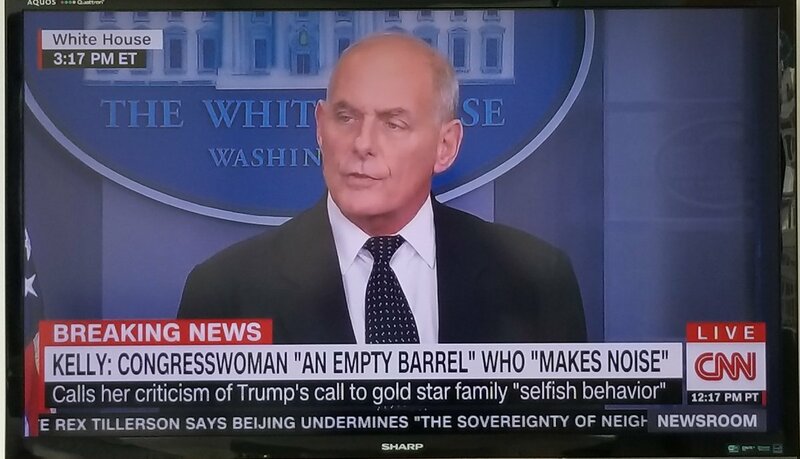 John Kelly owes Rep. Wilson an apology. Shame on General Kelly--is some of that racism in the Oval Office catching? John Kelly, answering a question as to why U.S. Special Forces are in_Niger: We are in Africa to "teach them how to respect human rights". John Kelly has the nerve say that he is sending the US to a foreign country to teach somebody about human rights and he hasn't even taught the president anything about human rights. some good Ku Klux Klan members. Then yesterday Kelly has no defense for what Trump said to the war Widow so he simply attacks the Congresswoman who brought it to the Forefront. People make personal attacks when they don't have any facts to stand on. To make matters worse his personal attack was inaccurate and a lie. To make matters even worse, he sends out an idiot girl Huckleberry Sanders to tell everyone that the congresswoman was stupid and a liar. Now first trump said that she lied, then Kelly said she lied, then Sanders said she lied-- so now we've got three liars in the White House. But the congresswoman is backed up by the hard evidence of videotape, media investigations, and of all people James Comey! It's a small small world but it looks like it's going around in circles. He should feel that way but I'm not sure he has the character that people seem to attribute to him. I think that character is a show. He flies with the crows, man. Sarah Huckabee Sanders suggested that reporters should let the matter drop " Kelly's criticism of Dem lawmaker's speech "and should not be challenging Kelly, a retired Marine general. "If you want to go after General Kelly, if you want to go after a four-star Marine general, that's highly inappropriate," she said. Sanders has definitely been around Trump to much.